Watch your favourite video songs and movies in video player. It supports H.264, VC, MP4, H.263, VC file types. Listen to your favourite songs in music player. It supports AMR, AAC etc. file types. 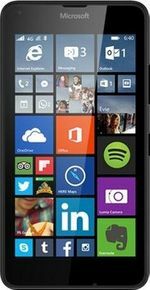 Microsoft has recently launched the new Microsoft LUMIA 640. The new smartphone by Microsoft seems to thrill your senses with its multi-dimensionally perfect DNA. Microsoft Lumia 640 price is expected to land around INR 11,999. The device works smooth with no time lag and an exceptionally brilliant multitasking experience. Microsoft LUMIA 640 features a HD 5 inch display with a resolution of 1280x720 pixels. The 5 inch display offers a great view in all kinds of ambient light. The LUMIA 640 lenses are defined by the autofocus 8 megapixel rear camera, and an optimal 0.9 MP front camera, which is right up for the purpose of selfies and video calling. The primary camera supports 1080p video capture and is accompanied by an LED flash. Microsoft LUMIA 640 packs a trendy, slim and sleek design. Microsoft Lumia 640 is powered by a 1.2 GHz quad-core processor to be one of the few smartphones by Microsoft based on quick processing technology. Lumia 640 comes with an inbuilt memory of 8 GB, expandable up to 128 GB by a microSD card. The powerhouse of the device is a 2500 mAh battery. Lumia 640 runs on the latest Windows 8.1 which makes it one of the trendiest devices in its lineage. The phone is ready to run Windows 10 once it starts rolling out. The added assets of the phone are Wi-Fi, Bluetooth v4.0, GPS and DLNA. The phone sensors include gyroscope, proximity and compass. The Lumia 640 has all of the features you would expect from a smartphone that’s twice the price. I used Lumia 640 for last one year.. I never face any lags in working. Battery backup is unbelievable to compare any 2500mA android mobiles. 2. Camera clarity is awesome when in good lights. 1. Front camera should be 5mp. 2. To much lags of application in store.
. Good battery even goes for 2 days.
. snapdragon 400 processor which is better as compared to lumia 540 with 200 snapdragon processor makes game smooth and fast.
. Dual sim which a windows phones mostly not gives.
. large storage space 8gb even expendable to 128 gb.
. Nokia brand is not present in phones which makes it less show offy but not so much.
. it should be a 4g lte phone as the speed is more than a 4g android phone. DISSOPPINTED WITH LOW LIGHT CAMERA QUALITY. IT SHOWS PIXALATION (SMALL DOTS) WHILE TAKING PHOTOS.